The picture above is of a landmark that’s well known by fans of the Wimbledon Championships tennis tournament that is taking place in London right now. It’s Henman Hill, the grassy mound smack in the middle of the Wimbledon venue, nicknamed thus for the now-retired British player Tim Henman. 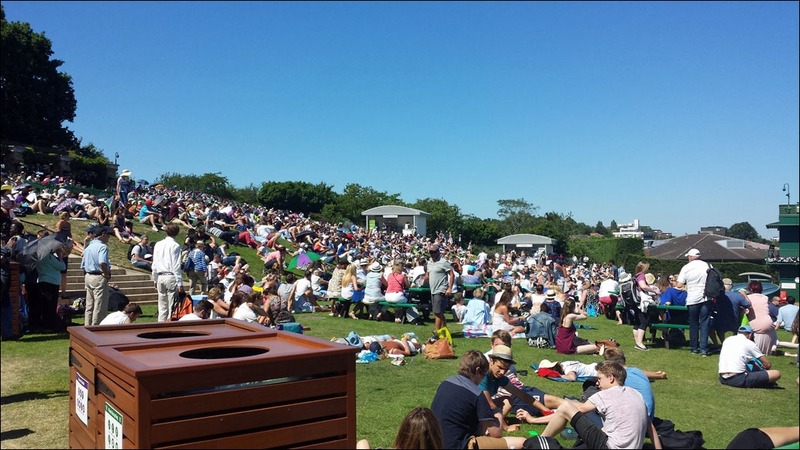 It’s packed with people – and usually more than than you see here – enjoying the live tennis on huge screens at the side of Number 1 Court to the right, just out of the view, or having a picnic in the glorious summer sunshine. I took the picture when I was there last week, on June 30, the second day of the championships. I was there not so much to see the tennis, more to get to know about the technology behind the event that makes the tennis an enveloping experience combining the audio-visual live-action that you see and hear at Wimbledon itself; and on TV screens, computer monitors, tablets and smartphones wherever you are in the world with a network connection, along with data-driven information that adds enrichment to your experience. 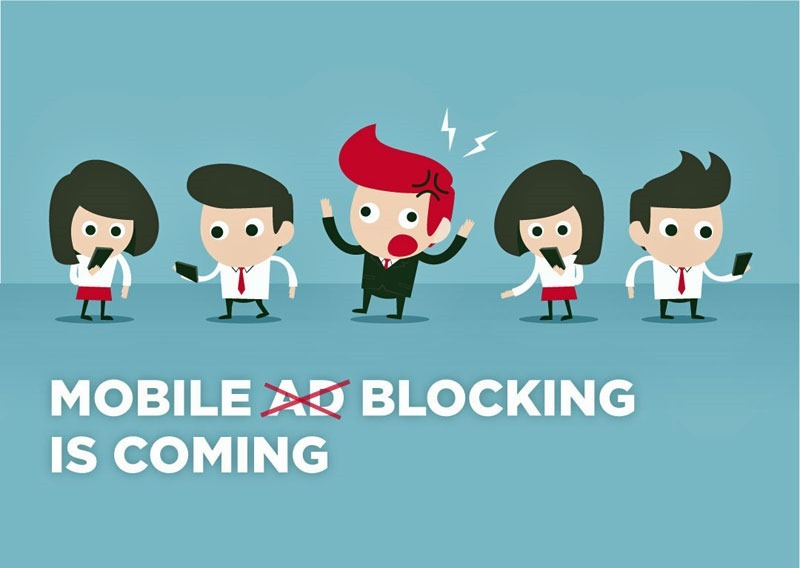 I was there to find out about that last bit – the data that adds the enrichment – thanks to an invitation from Andrew Grill, Global Managing Partner in IBM’s Social Consulting business. IBM is Wimbledon’s prime technology partner, a rather dry phrase that somewhat under-states the role IBM plays largely behind the scenes in enabling that enrichment I mentioned. And so I arrived at Gate 5 to meet Andrew, suitably attired for the occasion. It was a blisteringly hot day on Tuesday last week, with temperatures in the afternoon well in excess of 33 degrees Celsius. The cool air-conditioned and climate-controlled interior of the IBM Bunker, the first port of call on our Wimbledon tour, was a most welcome respite from the heat and humidity outside. 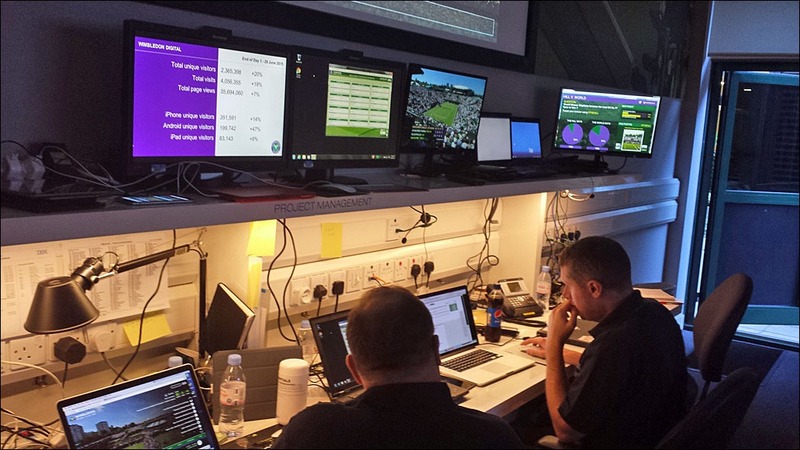 Deep beneath the media centre building, the IBM Bunker is the central hub of IBM’s data services for Wimbledon. Our bunker guide was Sam Seddon, IBM’s Wimbledon Client and Programme Executive. In plain English, he’s the man responsible for managing the end-to-end delivery of the technical solutions that IBM provides to The Championships. One end of those technical solutions is the rack of servers that funnel data to the screens of a dozen or more IBM engineers in the bunker who are the sharp end, so to speak, of analysing and extracting insights from the huge amounts of data generated from the activities across the 19 courts of the Wimbledon complex, to be used by the match commentators, the TV broadcasters and internet video feeds, on the Wimbledon.com website – built and maintained by IBM – and to the apps people install on their mobile devices. From here, data is also provided to the media in the media centre that helps them build their commentaries and stories. There is so much data, says Sam, that IBM has people in every court who are able to help presenters and reporters construct their stories and reporting through helping them understand what the data can tell them. Data analytics is a key part of what IBM does here – and an aspect I was keen to know more about – along with social media analysis and reporting. The picture above shows two of the team of engineers who pay attention to what’s happening across the web. Note in particular the monitor with screen in purple/white at top left, displaying some metrics about website visitors the day before my visit. 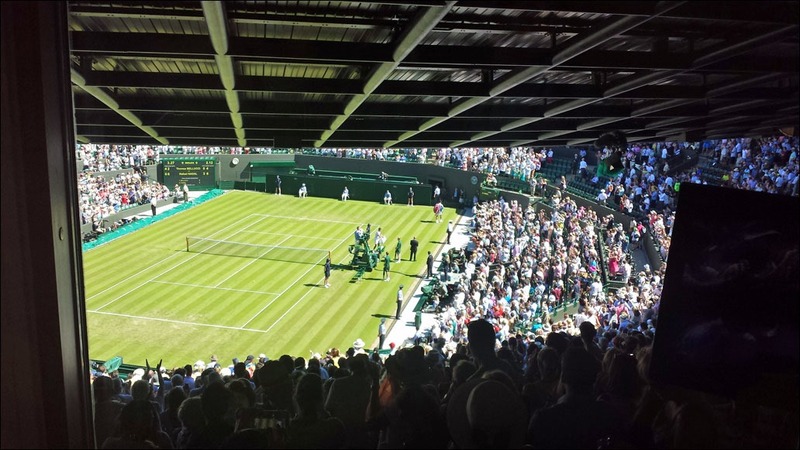 2,365,398 total unique visitors to Wimbledon.com on June 29, it says. Project that out across the two weeks of these championships, and you’ll get a number probably far north of 30 million. Sam told us that data from Wimbledon’s 19 courts comes into this room. That includes data created from tennis experts and others stationed at each court who capture datapoints like the speed of each player’s serve which they input into the system as quickly as possible. The target is to be 100% accurate, says Sam, as well as quick. Last year about 3.2 million datapoints were captured, he says. With at least two people per court, three on the smaller ones, that’s well over 40 people who are capturing every movement of every player and entering that data into the IBM system for analysis and insight-creation, which is where the TV commentators, etc, I mentioned get the real value. 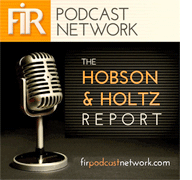 Data is the raw material: it’s the insights gleaned from analysis of that raw material that really matter. 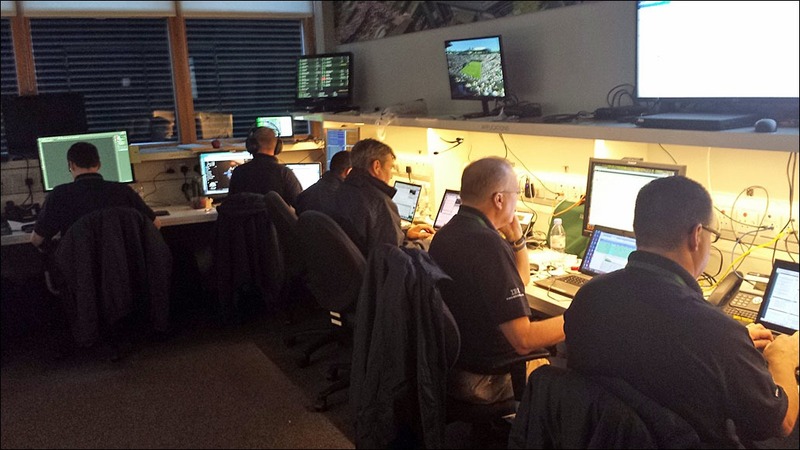 Website security is paramount: the above shows part of the security team of engineers who keep an eye on the IBM cloud servers around the world to ensure “digital Wimbledon” stays up 24/7. One of the amazing things about the IBM Bunker is that it exists only for the fortnight of the Wimbledon Championships. All that tech, all that engineering skill, all that talent, it comes together in Wimbledon each year for less than two weeks. Yet it’s part and parcel of what IBM delivers to its primary customer, the All England Lawn Tennis and Croquet Club which owns Wimbledon, and in turn the broadcasters and others who produce the content that you see (and interact with) on your TV, computer, mobile device, etc. Not only that, IBM also provides the players with data insights on their quality of play and more that enable them to analyse their performance in every match. That must be exceptionally useful and valuable to them. And I heard about and saw a great deal of IBM Watson, what IBM describes as “a cognitive system that enables a new partnership between people and computers that enhances, scales and accelerates human expertise.” I think of it as a sort of a digital Mechanical Turk that answers questions when you type them in. That’s not to make fun of it. On the contrary, this is sophisticated technology that does some simple-looking things quickly, and learns more every time you ask it a question. You can ask relatively simple tennis-related questions – eg, “when is Andy Murray’s next match?” – and get an answer pretty quickly. Sam told me that the plan is to develop Watson so that TV commentators and others can ask it anything related to what they’re talking about at that moment, to dig up myriad facts, with relevant context. We continued our tour with a conversation with some of IBM’s social media team, which opened my eyes (ears) to the importance and measurable value of the strategic use of social media where data analysis leading to valuable insights is paramount. It also demonstrated clearly to me that if you are to deploy social media in your business, you really must have the right skilled and talented people who can measure it and interpret outcomes – the missing link I see too often in some companies large and small. During our bunker tour – and, indeed, for much of our overall time at Wimbledon – my host Andrew Grill video-recorded just about everything. 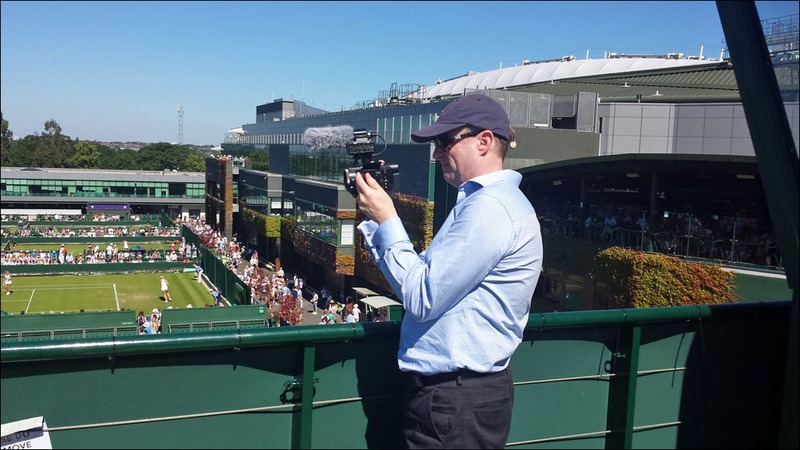 So coming soon on this blog will be some additional posts with further narrative from me plus embedded videos that will give you the detail of Sam Seddon’s commentary with some fascinating insights into the detail of data analytics and social media analysis at Wimbledon, as well as additional commentary from other IBM experts. In fact, here’s Andrew on the roof of the media centre with that camcorder! It was a tremendous afternoon and I thank Andrew and Sam especially. And we did get to actually see something of the tennis, in case you were wondering about the ticket I had clutched in my hand when arriving at the venue (as shown in Andrew’s tweet, above). Not seated in any of the courts, you understand, more peeking over the shoulders of IBM’s tennis experts during their datapoint captures. And look out for more content here with those videos I mentioned. Subscribe to the RSS feed so you’ll get those posts automatically. All the pictures I took at Wimbledon are in an album on Flickr. All shot on a Samsung Galaxy S4. Pretty good camera on that device.